The amazing Cirque du Soleil’s first permanent show in Las Vegas, Mystère is still considered to be one of the best performances in town. Describing this show as simply a “circus without animals” doesn’t begin to do it justice. Honored eight times as "Best Production Show" by the Las Vegas Review-Journal, Mystère has an international cast of 72 performers featuring dancers, singers, musicians and champion-caliber acrobats. 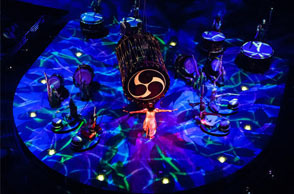 The Chicago Tribune called Mystère, "one of the most innovative and exciting shows to be seen anywhere". An intriguing blend of beauty and strength, power and grace, passion and precision… this is Mystère by Cirque du Soleil. Come, live the exoticism!